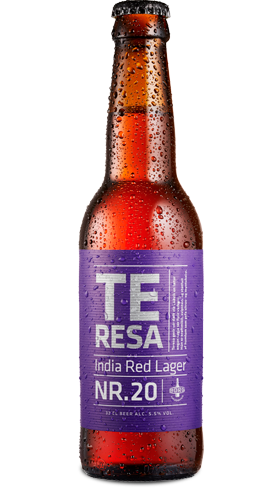 A deep red lager, cold- and bottom-fermented as well as dry-hopped with specially selected American hops and Polaris, new and exciting hops from Germany. The result is a cornucopia of tropical fruits; mango, peaches, passion fruit and blood orange, and in the back a lingering taste of sweet and buttery caramel biscuit. Teresa is named after Therese of Saxe-Hildburghausen. She was on the list of possible brides for Napoleon, but in 1810 married the Bavarian crown prince Ludwig II of Bavaria. Their wedding was the occasion of the first ever Oktoberfest.